On 6th December 2012, we celebrated 90 years since the enactment of the Irish Free State Constitution and the birth of the modern Irish State. Our four speakers combined to give a fascinating insight into this forgotten document. Professor David Gwynn Morgan was first to speak, explaining the difference between the separation of powers in the 1922 and 1937 documents. He also questioned whether the current interpretation of the doctrine was ever intended by either document. Dr Neil Buttimer next demonstrated the variations in the Irish language text of both documents, explaining the interesting influences on the type of Irish chosen. He explained how the 22 version contained a Munster dialect and in some cases, an older version of spelling, harking back to the 17th Century. He also reflected on the amount of work which went into the translation and the important precedent which was set by translating the document into Irish. He concluded that there is much work left to be done on researching the Irish draft. Dr Laura Cahillane then provided a new perspective on the 1922 document by showing all of the various innovations and devices included in 1922 in order to create a new democratic Irish State but pointing out that the original spirit of the Constitution was distorted by outside factors and that these details have now been forgotten. She also suggested that the document could still be useful in relation to reform and that perhaps we should take another look at some of those original experiments. Finally Tim Pat Coogan outlined the context behind the document, picking out two members of the Constitution Committee to focus on – Darrell Figgis and Michael Collins. He felt that it was a pity that the Constitution was distorted by party politics and by the Civil War divisions and he agreed with Laura that some of the 1922 experiments should be revisited. He also drew parallels between the state in which we find ourselves now and the period of 1922 and he concluded that we are far from fulfilling the ideals and dreams of those who drafted the Constitution. 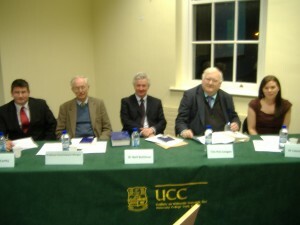 Dr Andrew McCarthy chaired the event and also provided some historical insights during the question and answer session. Thankfully the cold and wet evening did not dampen what turned out to be an enjoyable evening of reflection and discussion.